The Caine Mutiny (1954) is the story of shipboard conflict and a mutiny aboard a WWII naval vessel, and the subsequent court-martial trial of the ship's captain. The film follows in the long tradition of naval mutiny and court-martial films, such as Mutiny on the Bounty (1935), The Sea Wolf (1941), Treasure Island (1950), and Billy Budd (1962). The film with the tagline: "As Big As The Ocean," was based upon Herman Wouk's best-selling, and 1951 Pulitzer Prize-winning novel of the same name, from a screenplay by Stanley Roberts. (Wouk's original novel of about 500 pages had already been the basis for a successful nationwide stage play titled The Caine Mutiny Court Martial.) Independent producer Stanley Kramer and director Edward Dmytryk (one of the original blacklisted "Hollywood Ten" and director of Murder, My Sweet (1944) and Crossfire (1947)) had earlier collaborated on the melodramatic thriller The Sniper (1952), the dramatic combat film Eight Iron Men (1952), and The Juggler (1953) with Kirk Douglas, but this fourth film was their most-acclaimed and successful work. 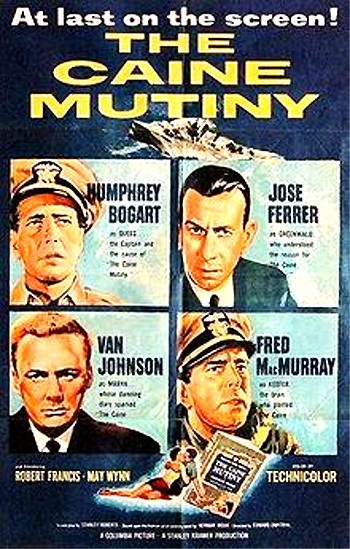 It was adapted for a Broadway stage play (by producer Charles Laughton) with Lloyd Nolan as Captain Queeg and Henry Fonda as Lt. Keefer, and later became a Robert Altman-directed TV movie The Caine Mutiny Court Martial in 1988, with Eric Bogosian (as Greenwald), Jeff Daniels (as Maryk), Brad Davis (as Queeg), Peter Gallagher, Michael Murphy, and Kevin J. O'Connor. Similar to the making of From Here to Eternity (1953) - another film depicting semi-negative aspects of military life, the Navy Department originally objected to the making of this film, due to its depiction of a mentally-disturbed man (obsessed about the theft of frozen strawberries, and continually rolling steel balls in his hand) as the captain of a US naval vessel, and the use of the word 'mutiny' in the film's title. After concessions were made within the script, the Navy fully cooperated with Columbia Pictures (and chief studio head Harry Cohn) by providing ships, planes, combat boats, and access to Pearl Harbor and the San Francisco port. This was Humphrey Bogart's last great film role (he died three years later). Bogart received his third Best Actor nomination (one of the film's seven nominations) for his late-career performance, but lost to Marlon Brando in On the Waterfront (1954). There were six other un-rewarded nominations: Best Picture, Best Supporting Actor (Tom Tully), Best Screenplay, Best Sound Recording, Best Film Editing, and Best Dramatic Score (Max Steiner). Fred MacMurray was again cast against type as an unlikeable Lieutenant (similar to his earlier role in Wilder's Double Indemnity (1944) and later in The Apartment (1960)). They're makin' a mistake scrapin' this ship. The only thing that's keepin' the water out is the rust. DeVriess: Disappointed they assigned you to a minesweeper, Keith? Keith: Well sir, to be honest, yes sir. DeVriess: You saw yourself on a carrier, or a battleship, no doubt. DeVriess: Well, I only hope that you're good enough for the Caine. Keith: I shall try to be worthy of this assignment, sir. DeVriess: She's not a battleship or a carrier; the Caine is a beaten-up tub. After 18 months of combat it takes 24 hours a day just to keep her in one piece. The first thing you've got to learn about this ship is that she was designed by geniuses to be run by idiots. This is the engine room. To operate, all you need is any group of well-trained monkeys. Ninety-nine percent of everything we do is strict routine. Only one percent requires creative intelligence. There is no escape from the Caine, save death. We are all doing penance. Sentenced to an outcast ship manned by outcasts, and named after the greatest outcast of them all. When DeVriess of the Caine is soon transferred in November 1943, he speaks of the watch given to him as a going away present by a scruffy sailor named Meatball (Lee Marvin): "Might as well have a souvenir of this old bucket. Not a bad looking watch at that...I'll always keep it a half hour slow. Remind me of the fouled-up crew of the Caine." Just another naval officer. I've had seven tough years in the Atlantic, and believe you me, they made the last two mighty interesting. The way those subs ganged up on us, I thought they had it in for me personally...Anyone who knows me will tell you I'm a book man. I believe everything in it was put in for a purpose. When in doubt, remember on board this ship, we do things by the book. Deviate from the book and you'd better have a half a dozen good reasons. And you'll still get an argument from me. And I don't lose arguments on board my ship. That's, uh, one of the nice things about being captain. I want you to remember one thing. On board my ship, excellent performance is standard. Standard performance is substandard. Substandard performance is not permitted to exist. That - I warn you. During the meeting, Queeg reveals one of his nervous habits - rolling a pair of steel ball-bearings in one shaking hand. Ensign Keith - appointed by Queeg to be the ship's Morale Officer, is both pleased with DeVriess' departure, and optimistically hopeful about Queeg's impressive approach to 'clean up' the ship according to regulations and standards: "Well, he's certainly Navy," but the treacherous Lieutenant Keefer cynically comments: "Yeah. So was Captain Bligh." I know a man's shirt's a petty detail, but big things are made up of details. Don't forget, 'For want of a nail, a horseshoe was lost and then the whole battle.' A captain's job is a lonely one. He's easily misunderstood. Forget that I bawled you out. From now on, gentlemen, there will not be any further mistakes on the part of the officers and crew of this ship...Let's all straighten up and fly right. But repeated incidents of poor seamanship, instability, inadequate command and judgment cause further trouble in the South Pacific. Next, Queeg earns the nickname "Old Yellowstain" (from Keefer) for becoming distraught, snapping under pressure, and turning cowardly under fire during naval combat exercises. While escorting amphibious Marine attack boats toward a Japanese-held island beachhead, the unnerved Queeg outruns them, then retires at high speed (before the 1,000 yards off-shore mark) from the line of fire after throwing a yellow dye-marker overboard to guide the stranded landing crafts on their own to the beach. Some of the officers hastily compose a ballad in Queeg's honor: The Yellowstain Blues. As I always say, a command is a lonely job. It isn't easy to make decisions. Sometimes the captain of a ship needs help. And by help, I mean constructive loyalty. What I'm trying to say is, uh, a ship is like a family. We all have our ideas of right and wrong but we have to pitch in for the good of the family. If there was only some way we could help each other.